TORONTO — Two of Canada’s biggest banks are raising their benchmark rates for five-year, fixed-rate mortgages. 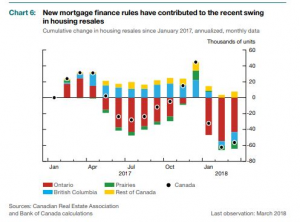 Mortgage planner and rate comparison website founder Robert McLister says the increase is “unusual” as the benchmark rate hasn’t seen a jump of 45 basis points or more since March 2010. Angela Calla has been a licensed mortgage broker for 14 years. She has been with Dominion Lending Centres since its inception in January 2006. Residing in Port Moody, British Columbia, Angela is a regular expert guest on several news stations, television shows, radio programs and local and national publications. She was the AMP of the year in 2009, and has consistently been one of DLC and the industry’s top performers since 2006. She can be reached at callateam@dominionlending.ca or 604-802-3983 for an questions or media requests. The Angela Calla Mortgage Team will work with you personally to ensure you get the best mortgage options. Contact us directly at 604-802-3983 or callateam@dominionlending.ca for assistance or for media inquiries. It’s never too early or too late to start planning to position yourself best in today’s market. There has been no shortage of changing in policies, and one specific area that continues to grow is reverse mortgage space. There are so many baby boomers who are house rich but cash poor and are living on fixed incomes. We have recently seen new lenders enter this space and competition makes lenders better! So having the power of choice with a reverse mortgage is welcomed, especially with so many mortgage rule changes making it even harder for the more mature borrowers to qualify as normally their highest income earning years are behind them. These mortgage options allow them to stay in their homes longer, access capital for further investment, healthcare, and travel and have monthly cash flow while enjoying the fruits of their decades of labour with NO monthly payments. If you or someone you care about can benefit from these new developments or want some clarity in evaluating all the available options without bias- we have a mortgage for that. Please contact us directly. Do you have a mortgage? So do I! Looks like we have something in common. Did you know that 6 out of 10 consumers break their mortgage 38 months into a 5-year term? That means that 60% of consumers break a 5-year term mortgage well before it’s due…but do you also know what the implications are of this? Let’s take a look! Exiting at the 2-year mark leaves 3 years left. For a 3-year term, the lenders posted rate. 3 year posted rate=3.44% less your discount of 2% gives you 1.44% From there, the interest rate differential is calculated. For the Smith’s $300,000 mortgage, that gives them a penalty of $15,300. YIKES! Now, Jane and John were smart though and used their Dominion Lending Centres broker to get their mortgage. Because of this, a different method is used. That would mean that the Smith’s would have a penalty of $2,700 on their $300,000 mortgage. For Variable rates mortgages, generally the penalty will be 3 months interest (no IRD applies). If you find yourself in one of the scenarios that we listed at the start of this blog, or if you just need to get out of your mortgage early, be smart like Jane and John—review your options with a DLC Broker! In the example above, it saved them $12,600 to work with a broker! It really does pay to have a Mortgage Broker working for you. No Down Payment? We Have A Mortgage For That! One of the toughest challenges for homebuyers is being able to save money at the rate of property price increases. We know many high-income renters would like to be homeowners, but they’re just unaware of how to make the transition and are unable to save fast enough. The B.C. government recently removed the equity partnership program, but there still is a remaining option. Kindly keep in mind this option won’t be for everyone as the following criteria must be met; it’s simply to illustrate the opportunity to go from renter to owner as soon as possible. The Flexible Down Payment program allows homebuyers to use existing credit facilities as their down payment. • Include borrowed down payment in the debt servicing of the deal. Example: Unsecured LOC at 3%, Credit Card at 3%, store brand Credit Card at 5%, Personal Loan at actual payments. We can walk you through the details, contact us today! Does your credit score keep you up at night? For some, this one detail in their life doesn’t pop up in their mind very much, because they know they’re making good money and paying all the bills on time. When you’re in that boat, it feels pretty good. But when you miss a payment or you struggle to pay all those credit cards, lines of credit and even your mortgage, it feels instead like you’re on a sinking ship without a life raft to save you. If you’re credit challenged but want to get into the housing market, it can be a tough road to hoe. But improving your credit to a point where a lender will give you chance, is very doable. First, I won’t bore you with the detailed minutia of credit scores. Basically, what you need to know is a score above 680 puts you in a good position to get financing, while below will make it tough and improvement is needed. Your credit score tells lenders some basic stuff about your credit: How long you’ve had credit, your ability to pay back that credit and how much you owe. And so your credit score is affected by how much debt you’re carrying in regards to limit, how many cards or tradelines you have and your history of repayment. If you’re a young person and new to the world of credit, consider the 2-2-2 rule to help build up your credit. Lenders want to see two forms or revolving credit, like credit cards, with limits no less than $2,000 and a clean history of payment for two years. It’s also good to note, a great credit score will also include keeping a balance on all those cards at any given time below 30 per cent of the limit. To ensure your score stays in playoff form, make sure to pay off any collections, like parking tickets, and correct any old or incorrect reporting on your credit score by contacting Equifax to have it removed. Some people also forget their credit cards have an annual fee and fail to pay them off too. And if you’ve been given the advice to get a couple credit cards but lock them in a vault where they can only be accessed through a sorcerer’s spell, you’re going down the wrong path. It’s all about showing the lender you use them, so go buy a stick of gum and pay it off. This cannot be stressed enough, if you want to keep or attain a good credit score, you have to pay your credit cards or tradelines on time regardless of whether you owe $1 or $1 million. There is a tendency when things get really bad to consider declaring bankruptcy or a consumer proposal. A consumer proposal is a formal, legally binding process to pay creditors a percentage of what is owed to them. You really want to avoid these two options. Instead, there are companies out there that will perform the same function and negotiate your debts, but it won’t impact your credit or carry the stigma of bankruptcy or a consumer proposal. Lastly, if you already own a home and have some equity, but you’re still drowning in credit debt, consider refinancing your mortgage. Sure, you might not get the great rate you have now or you might get dinged for breaking your mortgage early, but using the equity in your home to get rid of high interest credit payments could keep more money in your pocket at the end of the day.